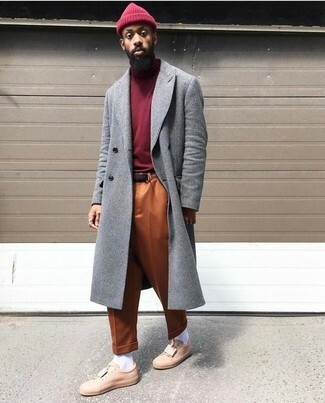 If you prefer comfort dressing when it comes to your personal style, you'll love this simple combination of a grey overcoat and Palm Angels flame socks from farfetch.com. When it comes to footwear, this getup pairs wonderfully with pink leather low top sneakers. 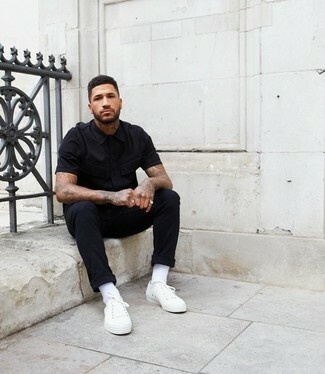 Rock a black short sleeve shirt with Palm Angels flame socks, if you feel like relaxed dressing without looking like a hobo. Turn your sartorial beast mode on and opt for a pair of white canvas low top sneakers. If you're all about comfort dressing when it comes to your personal style, you'll love this on-trend pairing of a black wool blazer and Palm Angels flame socks from farfetch.com. To add more class to your outfit, finish off with black leather loafers. 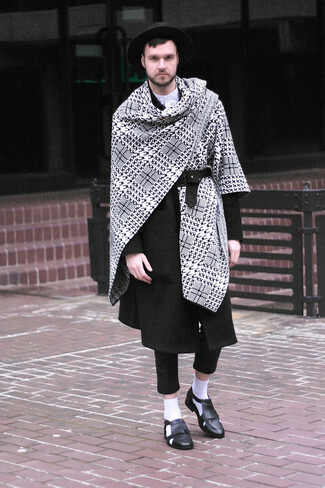 If you're all about relaxed dressing when it comes to fashion, you'll love this killer combo of a black overcoat and Palm Angels flame socks from farfetch.com. To add elegance to your outfit, complete with black leather tassel loafers. 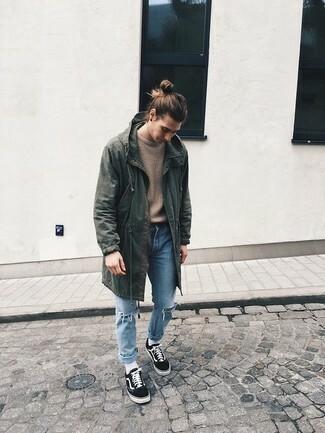 If you're all about relaxed dressing when it comes to your personal style, you'll love this easy pairing of an olive fishtail parka and white socks. Kick up the cool of your ensemble by complementing it with black low top sneakers. 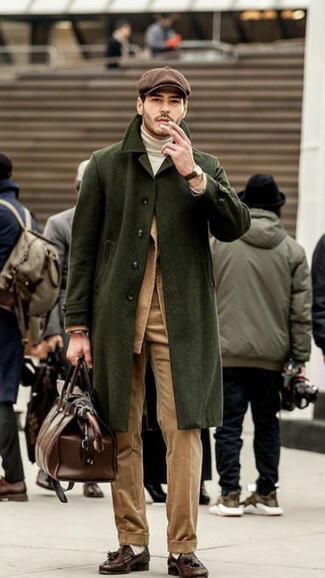 If you're all about being comfortable when it comes to putting together an outfit, this combination of an olive overcoat and white socks is just for you. Rocking a pair of dark brown leather tassel loafers is a simple way to add extra flair to your getup. This pairing of a grey crew-neck sweater and Palm Angels Flame Socks from farfetch.com is on the casual side yet it's also sharp and extra sharp. 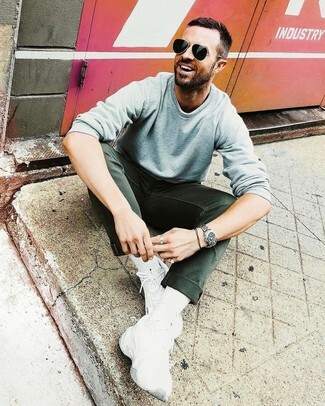 Let your outfit coordination prowess really shine by finishing your getup with white athletic shoes. 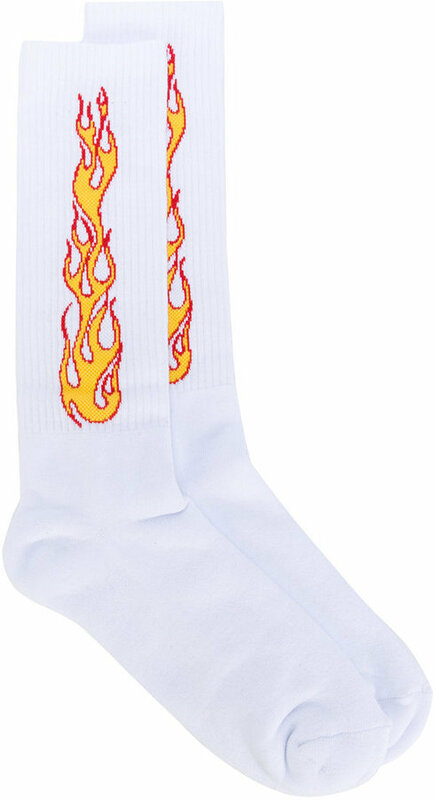 If you're a fan of practicality dressing when it comes to fashion, you'll love this simple pairing of a blue print crew-neck t-shirt and Palm Angels flame socks from farfetch.com. Sporting a pair of grey athletic shoes is a simple way to add extra flair to your look. If you're a fan of comfort dressing when it comes to fashion, you'll love this on-trend combination of a charcoal shawl cardigan and Palm Angels flame socks. Amp up the cool of your ensemble by rounding it off with brown leather casual boots.